'The compelling story that began in Identity satisfyingly concluded in Ultimatum; the story here meanwhile struggles throughout to convince that it even needs to be told'. Whilst the titles of all the previous Bourne films were somewhat general in their meaning, there is no reason at all for Jason Bourne to be called Jason Bourne other than the fact that Jason Bourne (Matt Damon) is in it. The marketing team would no doubt argue that that's reason enough when Bourne wasn't in the last film, but it's much more likely that nobody could actually think of a better name to call this fifth installment, marking as it does the point where the franchise finally ventures into generic territory. The compelling story that began in Identity satisfyingly concluded in Ultimatum; the story here meanwhile struggles throughout to convince that it even needs to be told. The flashbacks and missing memories are there because that's what the franchise does by this point, and whilst they by their very nature reveal new events in Bourne's past, these revelations add too little to who he is as a character and to the franchise mythos as a whole to feel worthwhile. Whilst the story may not be up to scratch compared to the original trilogy, even struggling to match the ideas within the inferior Legacy, there are still enough satisfying moments throughout to let you know that Paul Greengrass has returned to direct. An early sequence in Athens culminating in a motorcycle chase through streets filled with violent protesters is a highlight; a later tense London-based operation is one of Greengrass' very best accomplishments out of all three of his entries into the franchise. The director also shows on at least one occasion that he's still not afraid to make some gutsy decisions with his characters, and the film is better for it. In contrast, the Las Vegas set final act marks the point at which Greengrass takes the series further from its roots than ever before. It's not that the finale isn't entertaining, but compared to the relatively understated pleasures of the earlier films' set pieces this feels ostentatious for ostentation's sake - at times even like something out of a different franchise altogether. 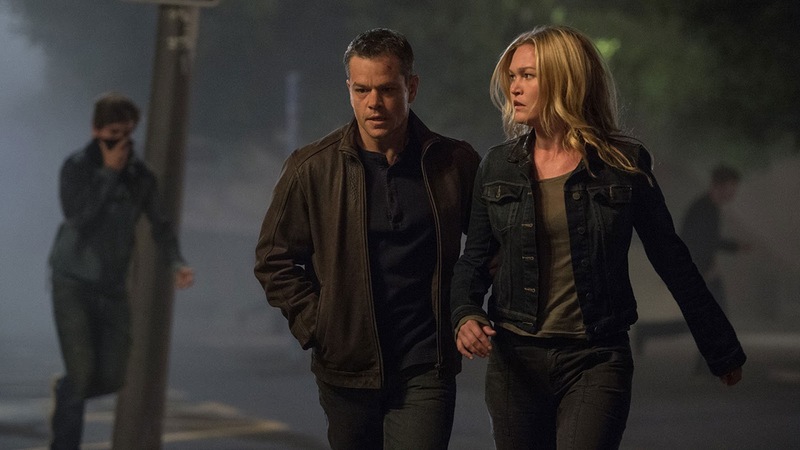 Jason Bourne therefore ends up as a mixed bag, but a consistently enjoyable one. With reliable established names Tommy Lee Jones and Vincent Cassel alongside fresh talents Alicia Vikander and Riz Ahmed joining the returning Damon and Julia Stiles, the most frustrating factor within the film is the sense that it should have been much better than it is. Even with a better script and story, Greengrass' third Bourne film may not have matched up to Ultimatum, still his best, but it almost certainly would have sat more comfortably alongside it.